Christine’s father John Diefenbach says she loved Wayne Newton, and checking for coverage of Newton in Parade magazine was routine. “She was a fan,” said Diefenbach. “She used to go out on Sunday morning to get Parade,” he added. The Diefenbachs now live on Long Island, having moved from Richmond Hill after Christine's death. While the family lived in Queens, Christine and other residents would use the Long Island Rail Road tracks as a shortcut to the newsstand and other stores. “She told me once that she had taken that shortcut, and I said ‘please don't do that,” said Diefenbach. When Christine left her house, police believe she used the shortcut. Instead of sticking to the sidewalks, Christine cut diagonally from 89th Avenue to Lefferts Boulevard along the railroad. “You know what bothers me is, I could have just said, ‘Do you want me to drive you?’ And I didn’t do that,” says Diefenbach. According to police, she barely made it past the staircase that led from the sidewalk to the railroad tracks. 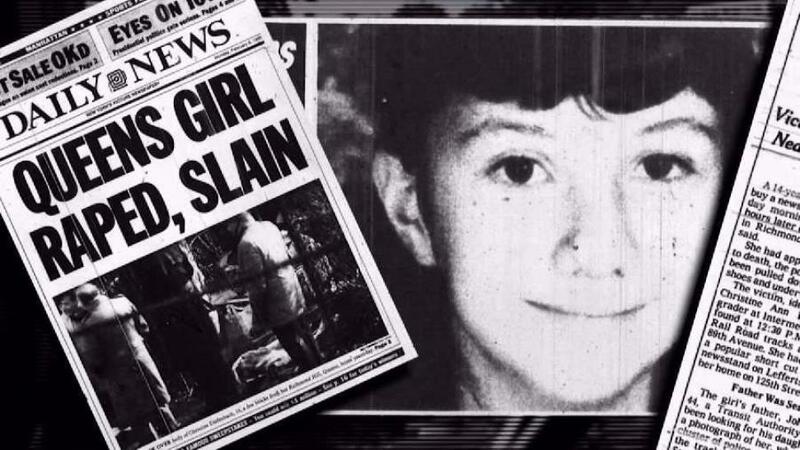 Every major newspaper in New York City reported on Christine’s death, and TV news crews also followed the case. At the crime scene, no weapons were ever found. Despite the news coverage, no serious leads ever surfaced for police detectives. Eventually, the case went cold. The case was picked up again by the NYPD Cold Case Squad in the mid-90s. “Her pants were pulled down below her ankles and she was brutally beaten,“ says retired NYPD cold case squad detective Thomas Wray. “There was no weapon found at the scene. She could have been kicked to death or just physically beaten,” said Wray. Wray is now a detective with the Queens district attorney’s Office. He retired from the NYPD Cold Case Squad in 2006. He was assigned Christine’s case in 1996. Although it was eventually determined that there were not any sexual crimes committed against Christine, to Wray, it’s clear how she died. “Basically she died from blunt force trauma,” he added. The death certificate shows Christine’s skull was crushed. The police report reveals what Christing had in her possession; just four quarters and a piece of gum. Wray says that while on the Cold Case Squad and digging through Christine’s case files, he happened across a tip from 1989. It was an anonymous call that came from a nearby bar called Glenn’s Tavern. “The caller named a person he knew as 'Cherokee' and said that he had a conversation with this person in the bar approximately a year after the homicide,” said Wray. The detective says the caller from Glenn’s Tavern claimed that “Cherokee” told him he was up on the railroad tracks a year prior to their conversation in the bar. “The terminology he used was, he ‘effed’ up a young girl that was up on the railroad tracks,” said Wray. The caller also mentioned that Cherokee "thinks he may have killed her." Additionally, the 1989 caller claimed Cherokee was also with a friend at the time of the attack. Police tracked down Cherokee and his friend and collected DNA samples from both men. The strategy was to match the DNA to evidence found on Christine’s body. But the technology available in the mid-90s couldn’t link the DNA to either man -- or any other suspect for that matter. Once again, the case went cold. But with today’s forensic science, re-testing that evidence could lead to a suspect. “What I'm hoping for right now is that this DNA is going to lead us down the right path,” said Wray. In 1988, the rail yard where Christine’s body was found was filled with abandoned train cars. It was the '80s, and New York City was the epicenter of the country’s crack epidemic. That area from 89th Avenue to Lefferts Boulevard along the railroad tracks was a haven for drug addicts and dealers. Glenn’s Tavern was down the tracks from the location where Christine’s body was found. According to cold case detective John Roberts, drinkers used the railyard to hang out or score some crack. Today, Roberts is investigating Christine’s murder. He keeps an old copy of Christine’s reward poster on his desk. Roberts says he has reviewed the case time and again. He finds himself walking down a very familiar investigative path. “As we sit here today, the suspects in my opinion, would be the two suspects that were identified by Detective Wray,” said Roberts. Roberts also looked at the information provided by the anonymous tipster that called Glenn’s. To the detective, it’s simple math. The call came from Glenn’s. The caller said Cherokee was at Glenn’s and the bar’s patrons commonly used the railroad tracks where Christine’s body was found. “Patrons of that establishment may have in fact been involved Christine’s homicide,” he said. John Diefenbach says that nearly three decades later, it’s still agonizing. “Maybe a transient or somebody who was on the tracks. Maybe a drug addict or whatever,” wonders Diefenbach. Regardless, the father of the innocent, murdered 14 year old girl – who today, would be 44 years old - says it is just not fair. “What right does that person have to take someone away from their loved ones and do the things, they did with her?” said Diefenbach. Police hope the recently discovered evidence and modern science will help provide new leads in a matter of months. If that happens, Diefenbach fears having to confront the one moment he’s hoped for, for nearly 30 years. “I want to see the person caught because you never know if he’s going to do this again. On the other hand, I dread going through a trial. I don't want to know what she went through. It was enough to have to look at the death certificate,” said Diefenbach.